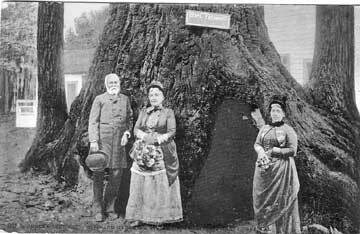 Speaking of books with a "local angle," this image depicts John C. Frémont, his wife Jessie Frémont, and their daughter, Lily, standing in front of what is thought to be California's oldest redwood tree, located in what is now Henry Cowell Redwoods State Park. I found the image online, on a website that tells the story of the Tracy family. I first saw the picture, however, in Passion And Principle, a book about the unusual political partnership of John C. Frémont and his wife Jessie, who was perhaps even more accomplished than Frémont himself. Frémont was a renowned explorer, called "The Pathfinder." He was California's first United States Senator, after having served as the territorial Governor of California as it moved towards statehood. He was a creative military commander, and the first person who, in the name of the United States of America, emancipated those held in slavery, and declared them free. 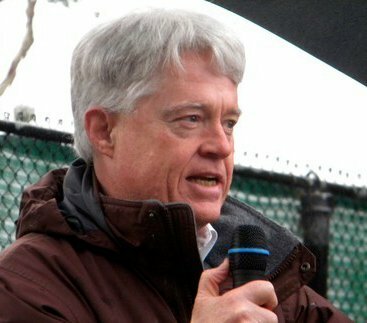 Frémont, who died penniless, was also, at one time, one of the richest men in America, based on his ownership and exploitation of Las Mariposas, a ranch in California's Sierra Nevada which produced something like $100,000 a day in profits from its many gold mines. The picture the book paints of California and American history, and of Frémont himself, is not really a pretty one. But it is a book worth reading, perhaps as a cautionary tale about the what happens when the pursuit of wealth becomes predominant over respect for both other people and the natural environment.